We are already expecting Samsung Galaxy S5 to surface during the new Unpacked event by Samsung on Monday February 24 in Barcelona. In all, the only clue we’ve got so far is the number 5 on the invitation photo that the Korean company is teasing us with. 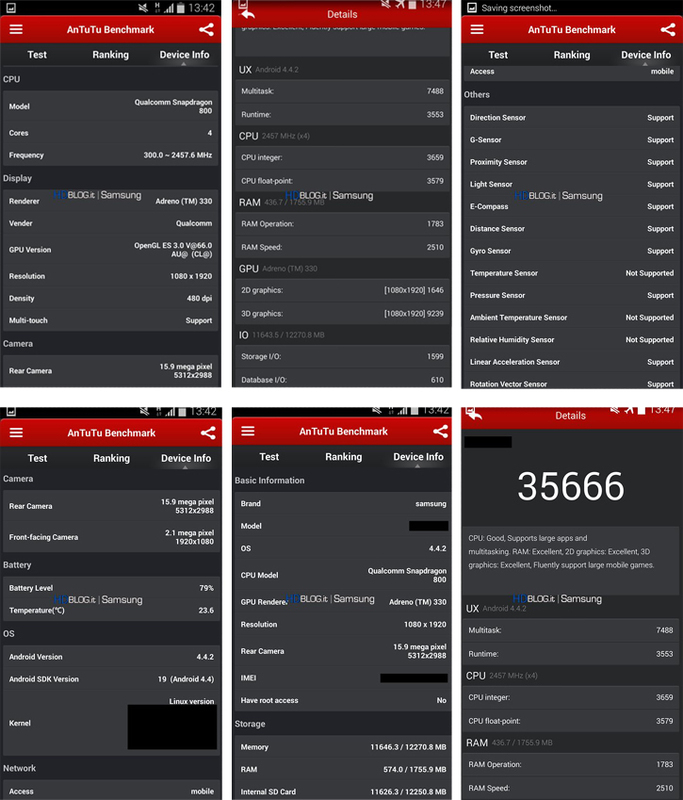 Whether we’ll finally see the fifth generation Galaxy S during MWC 2014 or not, we still bring some spoilers right from the AnTuTu benchmark database. Of course, we can’t say for sure the benchmark results indicate Galaxy S5, but we can’t ignore the presence of the 16-megapixel camera module plus the latest Android 4.4 KitKat out of the box. Assuming those are indeed the benchmark results of the next generation flagship device would be accurate. And here comes the bad news- according to the images, the display of the tested unit still sports only 1080p of resolution; however it’s possible for the Korean phone maker to be testing early versions without the QHD resolution. After all, this is most likely the prototype device before we see the final anticipated beast phone sporting 2560×1440. As for the other specs, we can clearly see the Qualcomm Snapdragon 800 CPU paired with Andreno 330 GPU all coupled with 2GB of RAM. Again, there’s still hope for the next generation Snapdragon 805 to make it upon launch. The 2GB also optimistically indicate that the tested device is only in a pre-final hardware state as it’s impossible for Galaxy S5 to offer less than the 3GB of RAM we can find on Samsung Galaxy Note 3. It’s pretty much certain that this isn’t the final pack of specs we’re looking at. But even now, the pre-final version of Galaxy S5 seems like a best phone that can eat most of Samsung’s flagship devices for breakfast.